Put away your wallet because we&apos;re about to tell you all of our favorite FREE things to do in San Luis Obispo County (SLO CAL). 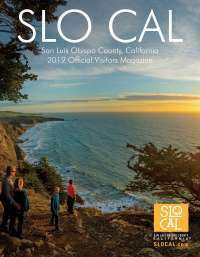 Whether you’re traveling with kids, friends or family, SLO CAL has a generous amount of fun and free activities and experiences for you to try. Locals love ‘em and we’re sure you will to! We bet you didn&apos;t know that SLO CAL had a waterfall. Nestled in the Santa Lucia mountains out near Lopez Lake in Arroyo Grande, you&apos;ll not only find a waterfall (or two) but scenic views, wildlife, swimming holes and a nature-made 30 ft. water slide. Be sure to pack snacks and water before you start out on Big Falls Trail, this hike is a longer one but absolutely worth it. Take in the local art scene at SLOMA. Peruse the galleries and view the exhibits of many local artists. If you happen to be in San Luis Obispo on the first Friday of the month, experience SLOMA and many other local galleries, museums and unique venues during Art After Dark. From November through February marvel at the fluttering Monarch Butterflies in Pismo Beach. Tens of thousands of these winged beauties flock to the Central Coast during migration and post up for the winter at the Pismo Beach Monarch Butterfly Grove. Learn all about these seasonal locals by asking one of the knowledgeable docents. Travel north on Highway 1 to San Simeon and find the Piedras Blancas Elephant Seal Rookery. Hundreds of elephant seals call this area home several times a year during mating and birthing seasons. Watch them as they play in the water, battle for a female and lounge on the beach. Learn everything you can about these bathing behemoths from one of the docents. Once you visit the Downtown SLO Farmers Market held every Thursday night, you won’t look at a Farmers Market the same. All the way down Higuera Street from Osos Street to Nipomo Street you’ll find local fruits, vegetables, artisanal goods, kombucha and dinner options from downtown restaurants including tri-tip sandwiches, ahi nachos and quesadillas filled with mac and cheese. Fill your stomachs then let your ears enjoy the sounds of the live music and entertainment happening on every block including the "Fresh Picked Concert Series"
Have you ever seen a moonstone before? Head over to Cambria&apos;s Moonstone Beach and scour the sands for these shiny and colorful stones. Get up close and personal with sea anemones, starfish, sea cucumber and crustaceans at Spooner&apos;s Cove or Hazard Peak Cove in Montaña de Oro State Park. Drive out towards Los Osos and turn onto Pecho Valley Road to find an underwater world close enough to view. Enjoy a day at the park! Pack a picnic and spend the day by the lake enjoying the sights and sounds of Atascadero. The entire family will love this city to sea trail. Park just off Highway 101 on Ontario Rd at the trailhead and meander your way towards crashing ocean waves in Avila Beach. This paved path is 5-miles roundtrip, so once you get to Avila, grab coffee at Kraken or a flight at the Libertine and then some lunch before you head back. Winter rains bring about a stunning spring wildflower show all throughout the Central Coast. Head out on Highway 58 through Santa Margarita for a beautiful display of yellows, purples and whites or head over to Los Osos for fields of blooming California poppies. For sprawling open space surrounded by wildflowers, drive out to the Carrizo Plain National Monument. No matter where you choose, you&apos;ll be able to take as many Instagrammable photos as your feed can take. Take a quick jaunt through the flora and fauna of the SLO Botanical Garden. Located on Dairy Creek Rd near El Chorro Regional Park in San Luis Obispo, explore two-acres of exquisite plant life, greenhouses and nurseries. Take an hour out of your day and experience disc golf at one of SLO CAL&apos;s many disc golf courses. Whether you&apos;re an avid disc thrower or a newbie, you&apos;ll be able to practice your wrist flick surrounded by oak trees, hiking trails and parks perfect for a picnic. Choose from Sinsheimer, Laguna Lake, or Heilmann Park. Year-round, San Luis Obispo County is rife with the sounds of live music. Put on your dancing shoes for a night with one of your favorite artists at unique venues near the coast, surrounded by vineyards, at the California Mid-State Fair and in historic theatres. Bring your lawn chair or simply grab a blanket and find a spot to groove to the sounds of local musicians playing downtown city parks and plaza&apos;s, wineries, breweries and farmers markets all over the county from spring-fall. You&apos;ll smell the spearmint and fruity notes before you hit Bubblegum Alley in San Luis Obispo but walking down it is a whole other sensory experience. Much like the gum wall in Seattle, visitors and locals alike love to visit this ever changing (and ever sticky) alleyway in the heart of downtown. Years of gum cling to the walls but there&apos;s always room for one more piece. Shy away from the city and head out to Morro Bay where you&apos;ll be able to hike, spot various wildlife, take a paddle through the bay and watch local fisherman unload the daily catch. Whether you choose to venture out on a nature walk along the boardwalk or fill your camera roll with pictures of otters, the Morro Bay National Estuary is fun for everyone in the family.